Well, folks. I'm starting week 16 and nearly through the fourth month. At the last doctor visit, I had lost around 5 pounds. As far as I can tell from our bathroom scale (which is not too accurate), I've gained one of those back. It's the strangest feeling to have lost weight but look like you've gained. I'm sure it's all about to catch up to me :). Don't make fun. My 'barely there bump' has left me without the use of most of my jeans and my work pants are a bit uncomfortable. My belts are on their last notch and I had to run to Target today to get a Belly Band. Thank God for those! For those of you who don't know, it allows me to wear my pants unbuttoned and unzipped without them falling down. We have another doctor visit on Tuesday. There probably won't be much to report from that visit. I cannot wait another four weeks to find out if we are having a Grantham or a Grantham-ette. On another note, we are getting our countertops resurfaced tomorrow. I'm so excited. I will post pictures once we get the sink and faucet in place! Let me know when you are ready to re-stain your cabinets and I will be over. Can't wait to see what color you chose for the countertops. Glad to finally see the "bump". Excited to see the pics of the kitchen. Finally! 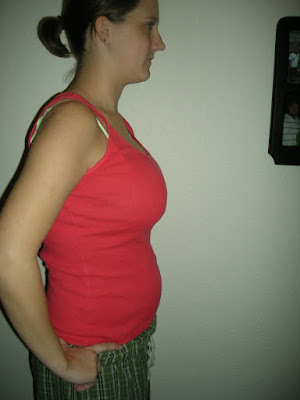 A baby bump picture!! You're too cute! Good luck at the doc, hope you're feeling better! love you! ps. LOVE the family pictures! Are you sure you have time for many more projects? I am excited for you and hope you will enjoy every day as your feet disappear from sight(HA) Good memories and your baby will bring lots of joy for a lifetime. I like seeing new updates. Love you. That is awesome! PS love your belly band! AWEE!! you look so great!